I ate like a pregnant woman yesterday and the day before. Sunday was a real throwback to my college days: I dusted my house and ate a late lunch consisting of a salad, picante chicken Ramen noodles, and some more deep-fried peanuts. I felt nauseous and had a headache. Then, for dinner, I had pizza, bread sticks, and two more salads. And I felt better. Yesterday (Monday), I had a garlic bagel on my way to the office, some Andy Capp's Hot Fries at around 10 am, a Kashi Tuscan Veggie Bake for lunch, then a "hungry size" bag of pretzels, then a snickers bar. Dinner was Morningstar Farms simulated buffalo wings, followed by two leftover pancakes from Saturday morning. I felt nauseous and had a headache. Then I went to the grocery store and only bought healthy snacks for the rest of the week, like carrots, celery and roasted red chili pepper hummus. This is why I didn't review the top-secret Canadian Doritos I recently picked up in Toronto. 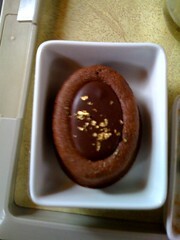 This is a picture of a small piece of double-chocolate cheesecake with some gold flakes on it. It was served to me on a train from Toronto to Windsor, Ontario. i like this style of post. feel free to throw one like it into the mix every now and again and so forth.